HTC delivered a great smartphone with the HTC One, but failed to capture the consumer market once again, leading to yet another disappointing year. Hoping to cash in on the success of the ever-growing “phablet” market, HTC released the HTC One Max late last year, hoping to take on the Samsung Galaxy Note 3 and the Sony Xperia Z Ultra. While slightly behind on the specifications, the HTC One Max features the company’s great design aesthetics, and boasts a beautiful, large 5.9-inch display. To help you get the most out of your HTC One Max, today, we’ll be taking a look at some of the best accessories for the HTC One Max. Let’s get started! The official HTC cases for the One Max are some of the best available. Combining its premium slim hard-shell with a protective fabric wrap-around, the HTC Double Dip Flip not only offers excellent protection for the front and back of the device, but also folds into a landscape stand, which means that you won’t have to keep holding such a large device while enjoying your music, movies, and games. Buy now on Amazon for $24.99. The HTC One Max features a large 3,300 mAh battery, but if you’re looking for some extra juice, along with great protection, the new HTC Power Flip case is the best choice for you. The sleek Power Flip Case features a 1,150 mAh battery that provides an extra boost when the case is wrapped around your device. A device battery icon shows up when the full-screen protective case is in use, and a green LED display indicates when both your case and phone are fully charged. Buy now on Amazon for $75.39. The Poetic Invictus Hybrid case for the HTC One Max fuses the protection of a hardshell, and the grip of a rubberized covering into one great case. This innovative case with a honeycomb inlay, also features a built-in kickstand for multiple viewing options. Precise cutouts give you access to all ports, buttons, fingerprint scanner, and camera. Since the HTC One Max is such a large stand, the availability of a kickstand is a huge plus. This case is available in two color options, white and black. Buy now on Amazon for $19.95. 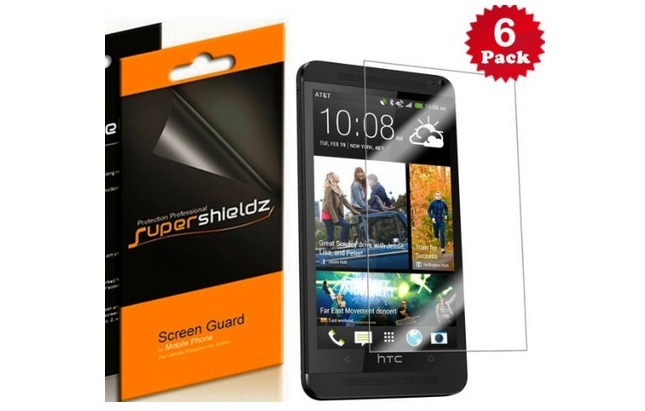 The SUPERSHIELDZ screen protectors are made from Optical Grade Crystal Film which are custom cut to ensure a perfect, and features a three layer construction – including a scratch resistant surface polymer, a hardened protective mask to prevent deep cuts, and a patented silicone gel that creates a vacuum to securely cling to the device screen. These screen protectors use no adhesive, and promises bubble free installation, as well as being easy to remove. The package include 6 HD Clear screen protectors, 1 smoothing card, and 2 cleaning cloths, and you also get a lifetime warranty with this product. Buy now on Amazon for $1.99. The FLOUREON external battery pack uses reliable Samsung battery cells (4×2600 mAh) that ensures quality, and promises more than 500 charge cycles during the course of its life. The battery pack features a torch for outside use, and LED indicators to show how much charge the pack has left. With dual USB ports, you can charge two devices simultaneously. This is also one of the cheapest battery extension packs available with a similar capacity. Buy now on Amazon for $28.99. The Patuoxun USB docking cradle features an unassuming, compact, and portable design, and holds the smartphone at a convenient angle for easy and convenient access (in portrait orientation) while on your desk. This desktop dock allows you to sync your device with your PC/laptop while charging your smartphone at the same time. Also features a built-in protection circuit to prevent overcharging and overheating. Is compatible with slim-fit cases for the HTC One Max. Buy now on Amazon for $10.99. The official HTC Car Kit can be mounted on a dashboard or windshield courtesy of a weighted base with a suction pad, and securely holds your smartphone in place in landscape mode. The navigation dock activates Car mode as soon as the device is placed in the dock, and will charge the phone as well, thanks to the built-in charging port. If you’re planning to use your HTC One Max for navigation purposes, the HTC Car Kit is a great accessory to have. The holder can easily be flipped to portrait mode, so the Car Kit can double as a desktop charging dock as well. Buy now on Amazon for $47.99. The HTC Bluetooth StereoClip allows you to stream high-quality sound from your smartphone to your car stereo or home speakers wirelessly. The Stereo Clip connects to your smartphone via bluetooth, and all you need to do is plug in the device to the aux port in your car or home speakers. Unfortunately, if you’re looking for additional functionality, you may be disappointed, as there is no way to control the music with the stereo buttons, and calls cannot be streamed through to car speakers using this device. There is a small battery in the Bluetooth adapter which charges using a micro-USB cable, and a full charge will get you around 5 hours of non-stop output. Buy now on Amazon for $49.99. The HTC One Max is a huge smartphone, and needing to pull it out of your pocket every time you need make/receive a call can be cumbersome, and the HTC Mini+ Bluetooth Handset provides the convenient and comfortable solution. The HTC Mini+ pairs via NFC or Bluetooth to your smartphone, and will allow you to take calls that may be coming in to your paired device. While on the call, you can still use your normal smartphone for web browsing, responding to emails, or even playing games. Additional functionality includes instant notifications of texts, emails, and calendar events, hands -free remote camera control that lets you take pictures from your phone at a distance, and can also work as a TV remote control, and also pairs with select HTC devices to operate multimedia streaming though your HTC Media Link HD. Buy now on Amazon for $89.99. If you’re tired of losing your phone or leaving it behind, the HTC Fetch is your solution. Just press the button and the sleek, compact keychain device activates your phone’s ringtone, within 15 meters. It works the other way too, that is, if you forget the Fetch, the device will emit a warning beep if you leave it behind. If you lose both, you can use the maps location feature to find out where the Fetch and the phone were last seen together. Buy now on Amazon for $39.95. The HTC One Max can connect wirelessly to a TV with the HTC MediaLink HD. The sleek black box connects to a TV via HDMI, and swiping up on your HTC One screen with three fingers shares whatever is on your phone display on the bigger screen. The MediaLink HD can also save up to 30 photos with its new digital photo frame feature, so you can share high-resolution photos directly from your phone to your TV. A dual screen mode lets you share movies or slideshows on your TV, while using your device to run apps. Buy now on Amazon for $89.99.